Birds on Tap – Roadtrip, 10/8/17: Migrants and Malts. Our 8th tour of the year with our partners, The Maine Brew Bus, ventured to Maine’s deep south and toured around the village of Kittery. October in Maine can produce all sorts of surprises, and Fort Foster is a great place to find the unexpected. 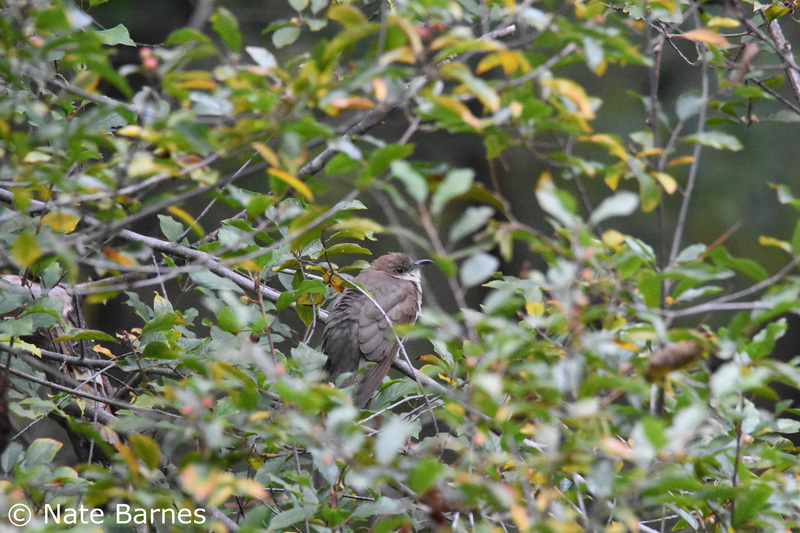 We started off with this BLACK-BILLED CUCKOO, a very late individual, that unlike most members of its species paused for photographs and long, satisfying views. Another treat was an “Ipswich” Savannah Sparrow on the beach and a nice little wave of Yellow-rumped Warblers among the residents in the woods, but then our biggest surprise of the morning – a wide band of steady rain! The rain impacted our visit (for the second year in a row!) to Seapoint Beach, but a small pocket of activity on the seaweed included at least 5 Northern Mockingbirds (one burst into song, despite the rain), 6 Yellow-rumped Warblers, and 2 Eastern Phoebes. Several adult Northern Gannets were just offshore, which was another highlight. 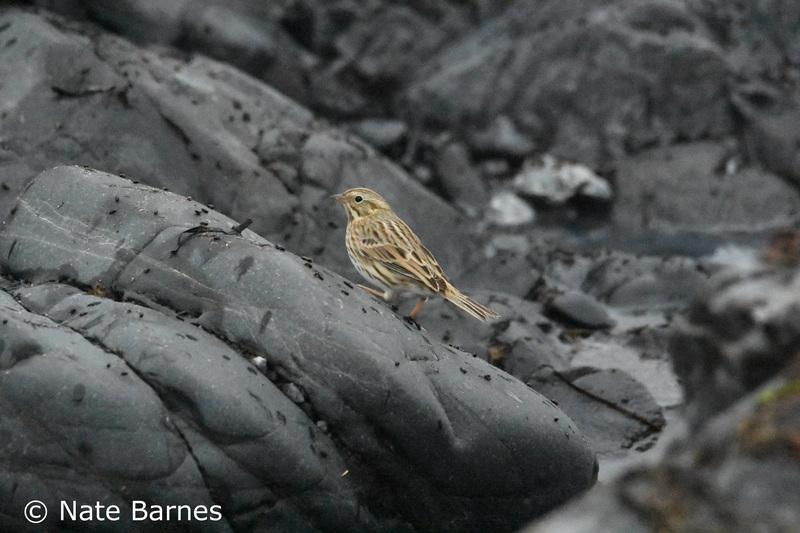 “Ipswich” Savannah Sparrow that breeds exclusively on Sable Island, Nova Scotia. With rain still falling, I skipped the walk at the beach, and instead made a couple of short stops where we were able to hang by the bus. 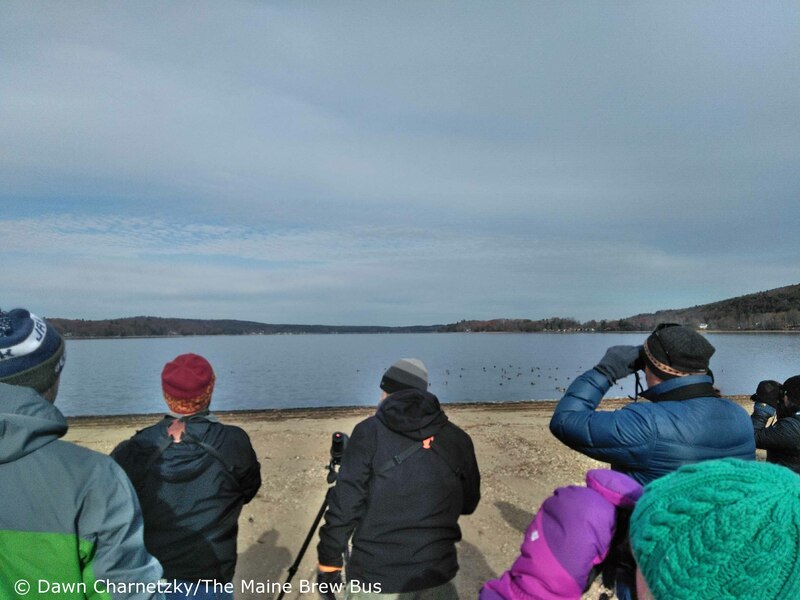 20+ Bonaparte’s Gulls were off the Kittery Town Landing, and by the time we arrived at Legion Pond to enjoy 3 spiffy Wood Ducks among the masses of Mallards, the rain not only stopped but the sun began to return. 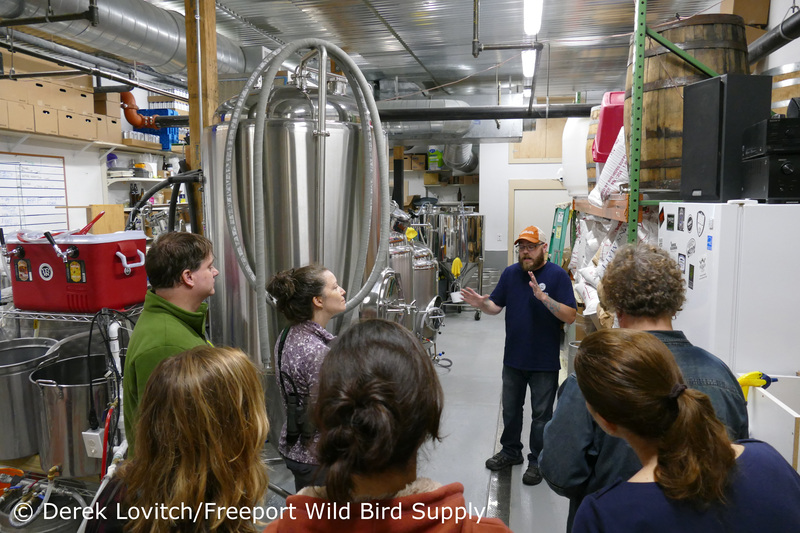 The first stop on the brewery tour was Woodland Farms Brewery, which opened only this February – but from the looks of things, had already gained quite a following! There, we sampled four brews from this lager-centric brewery. Very traditional and well-executed styles included Wolf Haven Extra Special Bitter (ESB) with a nice depth of flavor to balance the bitterness, and the Rowanbrau, a Dortmunder-style golden lager with a super-crisp-finish. We started with their light Cervaza Medico, a Mexican lager with a subtle sweetness from corn, and finished with a hop-forward Backyard Scientist IPL. A lot can be done with a lager, far beyond the basic American mass-produced swill, so it was a good lesson for us in the range of the technique. 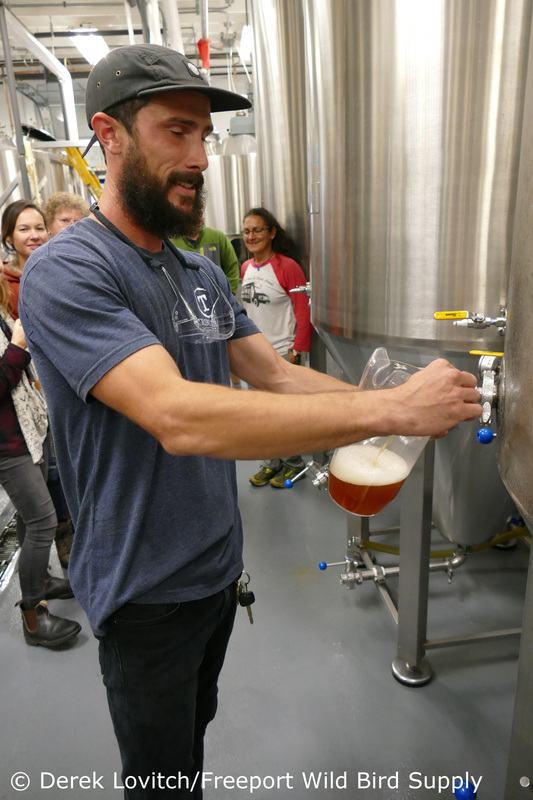 We learned about the benefits and limitations of focusing on lagers, and the methods that produce this style of beer, which we then contrasted with ales on our second stop, Tributary Brewing Company, where a wide range of traditional and modern styles were sampled. Starting with Oktoberfest, a perfectly-simple and clean version of the traditional German-style marzen, we finished with their Oyster Stout (anything but traditional), with subtle notes of minerality. In between, we tasted their Blueberry to find out what a beer with blueberries in the mash can really taste like (subtle, not in your face, and not overtly sweet at all) and their Pale Ale, their basic, but delectable flagship. In all cases, flavors were meant to be simple and subtle, complement the “basic” beer flavors and not overpowering them. While comparing and contrasting this subtle, delicate use of flavors, it was not surprising that a discussion of “pumpkin/pumpkin spice” beers came up, and so Ian tapped the unfinished Pumpkin for us to sample – even though it was still weeks away from being ready and was un-carbonated. We were duly impressed, as the subtle flavors were quite apparent, and it offered insight into the brewing process as well, which is something we work hard on offering during these special tours. With temperatures in the low 70’s, the rain was merely a nuisance, and it definitely impacted the middle part of our birding adventure. Regardless, a birding tour that begins with crippling views of a Black-billed Cuckoo and ends with stunning Wood Ducks is still a real winner! And if not, there was some great beer to enjoy and learn about! 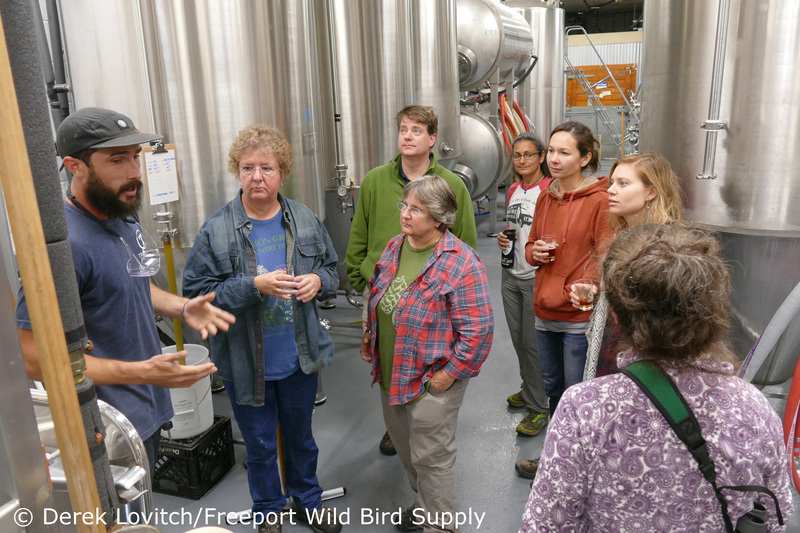 This entry was posted in Birding in Maine, Birds on Tap - Roadtrips and tagged "Birds, Birding, Birds on Tap, Birds on Tap - Roadtrip!, Black-billed Cuckoo, Fort Foster, Ipswich Savannah Sparrow, Kittery, Seapoint Beach, Tours, Tributary Brewing Company, trips, Woodland Farms Brewery, Yellow-rumped Warbler on October 8, 2017 by Derek.